50 square feet per gallon, 150-175 Linear feet per 4 inch Lap. A special blend of adhesive asphalts, fibers, special resins and other ingredients that assure its rapid fusion to the base surface. Intended primarily as a blind nailing cement for use with roll roofing. It creates a tight bond and prevents buckling and curling of edges. Roof adhesive is also suitable for application to older roofs to seal cracks and pinholes. Dries black. Clean surface with brush or broom, removing all loose sediment and dirt. Nail down any loose parts. 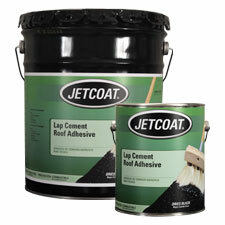 Apply JETCOAT Lap Cement Roof Adhesive with a roofer’s brush or a masonry trowel in a uniform consistency. Apply a sufficient amount of adhesive to cover the entire underside of the membrane and to allow a 1/8” – 1/4” bead of adhesive to form along the lap seam when membrane is pressed into place. Broom or walk the overlying sheet firmly into the cement and smooth it out to prevent buckles or blisters. Do not apply if rain is imminent within 24 hours of application. Clean tools with mineral spirits or kerosene in a well ventilated area immediately after use. Intended primarily as a blind nailing cement for use with roll roofing. 62735 4.75 gal. Pail 44 lbs. 62731 .9 gal. Can 8.8 lbs.